January 19, 2010 - The introduction of four UH-72A Lakota Light Utility Helicopters will significantly enhance the Alabama Army National Guard’s ability to perform homeland security operations and carry out support missions within the state. These aircraft – which are built at American Eurocopter’s Columbus, Mississippi facility for program prime contractor EADS North America – are based at the Army Aviation Support Facility #2 in Birmingham, where the initial two Lakotas were formally unveiled during a ceremony. The Alabama Army National Guard’s UH-72As are assigned to Detachment 1, Company C, 2nd Battalion, 151st Aviation Regiment. The unit’s federal-level missions include aerial command, control and reconnaissance in homeland security operations. It also is tasked with state-level support for Alabama’s governor and community-based organizations. The first new aircraft coming directly to the Alabama National Guard in many years, these Lakotas are to replace Detachment 1’s aging OH-58 Kiowa helicopters. 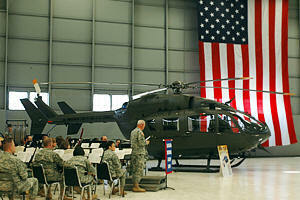 To date, 93 Lakotas have been delivered to the U.S. Army with an additional five aircraft provided to the U.S. Navy. The Army’s helicopters are based at active duty Army and Army National Guard locations throughout the United States, as well as in Puerto Rico. Future deployments of UH-72As are anticipated in the Pacific, Europe and Japan.